Since 2009, thousands of competitive gamers gather annually to celebrate the anniversary of the online game that changed their lives. This year, the party will be bigger, grander, and exciting as we celebrate everything we love about CABAL: the unique battle system, the guild camaraderie, and the passion we all share for the game. 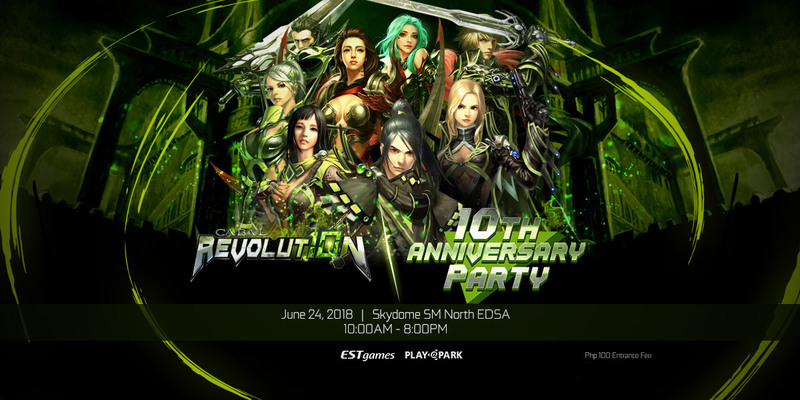 To our loyal, loving and amazing community, mark the date: June 24, 2018 (Sunday) for CABAL REVOLUTION: The 10th Anniversary Celebration! Gather your guildmates and friends for a fun-filled day of celebrations, tournaments, side events, and live entertainment. Note: The announced schedule and location may still change. Any revisions will be posted only on official channels – website and fan page.